ChondroCare is a comprehensive formula designed to provide broad support for healthy joint function by featuring premium quality glucosamine sulfate, chondroitin sulfate, and methylsulfonyl methane (MSM) in addition to other nutrients that support healthy connective tissue. * Features glucosamine and chondtroitin sulfates, which are buildings blocks for healthy cartilage. * Provides MSM, a natural compound that has been used to support joint health. * May help to maintain normal joint strength and flexibility by effectively supporting cartilage integrity. 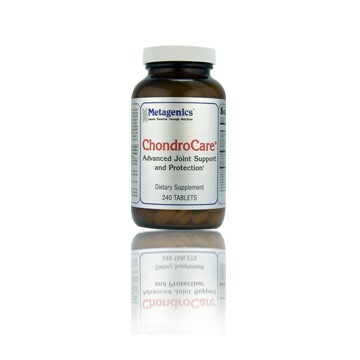 * Chondroitin and glucosamine support collagen synthesis to maintain shock-absorbing ability. * May help protect against the activity of enzymes that impact soft tissues. * Protects against free radical damage to joint tissue by supplying antioxidant support. Features glucosamine and chondtroitin sulfates, which are buildings blocks for healthy cartilage. Provides MSM, a natural compound that has been used to support joint health. Chondroitin and glucosamine support collagen synthesis to maintain shock-absorbing ability. May help protect against the activity of enzymes that impact soft tissues. Other Ingredients: Microcrystalline cellulose, cellulose, croscarmellose sodium, stearic acid, magnesium stearate, and silica. Contains: crustacean shellfish (crabshells, shrimp). Warnings: This product is not suitable for individuals with shellfish allergies. † Patented mineral amino acid chelate: U.S. Patent No. 5,516,925 Albion®.